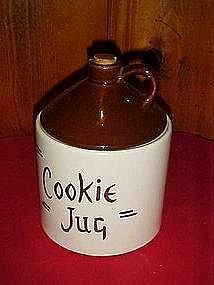 This old heavy cookie jar resembles an old moonshine jug, including the real cork in the top. Says Cookie Jug on the front. This may be a McCoy cookie jar, I'm not sure, but it is an older solid jar. Measures 10" tall. Bottom is in excellent condition, but the top section has a couple of chips on the inner rim of the lid. They can't be seen when the lid is on the jar. This reflects the low price. You can email me for more pictures if you like.